juanbook: AT (After Trump): Where is The Nationalist Trupm? AT (After Trump): Where is The Nationalist Trupm? Eleven people were injured, including a police officer, and nine were taken to a hospital, the Metropolitan Police chief, Peter Newsham, said at a news conference on Wednesday. Two Secret Service agents were also assaulted in the melee, according to a federal law enforcement official. 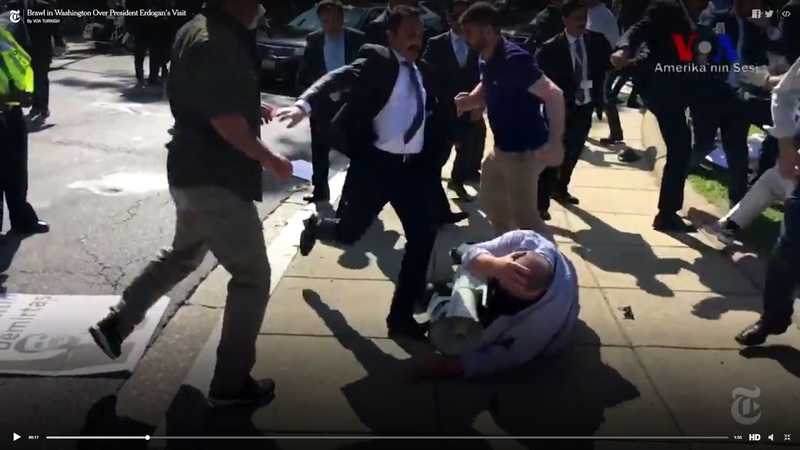 The State Department condemned the attack as an assault on free speech and warned Turkey that the action would not be tolerated. “We are communicating our concern to the Turkish government in the strongest possible terms,” said Heather Nauert, a State Department spokeswoman. A group of Republican lawmakers went a step further, calling the episode an “affront to the United States” and calling for Turkey to apologize. Where is the nationalist Trupm when Erdogan's security detail forget what country they are in and decide to attack protesters exercising their right to assemble and their right to free speech? Maybe offering his "hock colster" to the Turkish leader? Music: Chris Cornell's Inspiration For "Spoonman"